What benefit do we get here in exile, far away from our homeland, if we keep blaming and accusing each other for the tragedy of Tibet? Among us there may be a lack of courage to resist the Chinese government and follow in the footsteps of Tibetans who have sacrificed their lives for our cause. But there are no fewer people who are plunging the public into confusion through the perennial debate about what Tibetan people should struggle for: independence or regional ethnic autonomy. 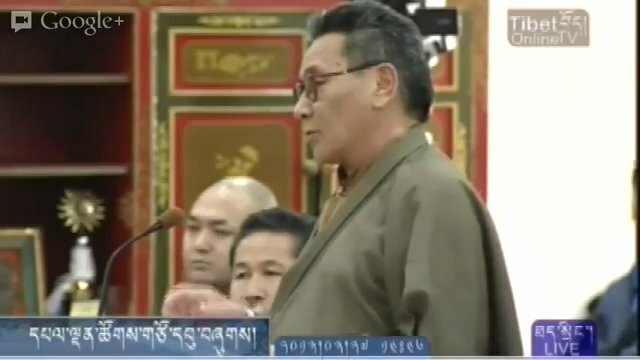 Contrary to the Parliamentary norms, as well as the normal understanding of the human mind, MP Thupten Lungrik then proposed that “today MPs should be allowed to speak as much as they wish to, without any time limit.” Speaker Penpa Tsering accepted this proposal, and asked the MPs to conduct a thorough discussion. A situation was created in which MPs faced the danger of appearing as criminals in the eyes of the Tibetan Dharamshala public if they refused to condemn Karma Chophel. As a result the MPs kept talking, even though they may not have had anything to talk about — they went out of their way to condemn Karma Chophel and independence advocates. Such a spectacle reminds us of the days of the Chinese Cultural Revolution. Hardly any Members are unequivocally condemning the corruption that exists in our society or denouncing the Chinese atrocities. Certainly not in the same active and involved ways that the Members are criticising Karma Chophel. And some of our exile leaders, rather than reflecting upon their own souls, seem to always shift the blame onto other people. His Holiness was speaking to a private audience; he was making a general comment — not aimed at particular individuals. The reduction of his lifespan [from 113 to 108 years] is related to his health matters. He will continue to pursue the Middle-Way policy and live among us as long as the Tibetan issue remains unresolved. The public was once again plunged into confusion. Which statement of our leaders is true? The one made in the beginning or this latest one? The five protesting Tibetan elders returned to their dwellings, shaking their heads. The truth is that Karma Chophel did not say that the Dalai Lama, in his heart, wanted to struggle for Tibetan independence. What Karma Chophel said was this: “I think His Holiness had independence in his heart.” Karma Chophel, in other words, was expressing his doubt — making speculations. It would have been more appropriate if the MPs simply told Karma Chophel to “mind his own business rather than speculating what lies in the heart of His Holiness.” There was no need to distort Karma Chophel’s statement, to blow things out of proportion, as if all hell had broken loose. And further, there are many Tibetans who assert, “From the leaders at the top to ordinary folks at the bottom, every one will be happy if Tibetans regained their independence.” I don’t know if His Holiness could be counted among them though. How can Tibetans not be allowed to feel for independence in their hearts? The Chinese, despite their extreme repression, have failed to wipe out the religious faith and nationalism that remains in the heart of the Tibetan people. But here in exile, Tibetans have to look here and there, suffering from a strange guilt and doubt, before speaking about Tibetan independence. If it is propagated among the public that because of the “misdemeanour of a few people, Dalai Lama’s life span has been reduced to 108 from 113,” these “few people” will not be spared by the faithful masses. The accused “few” cannot tolerate this. Therefore, it is very important for the Tibetan leadership to clarify to the public what sort of exact connection lies between the struggle for Tibetan independence and His Holiness the Dalai Lama’s longevity. When religion heavily influences politics, issues can become distorted and cause unnecessary problems.